Today (though some sources give July 17 as Linkletter’s birth date) is the birth anniversary of Art Linkletter, television and radio personality. He would be 100 this year. In honor of his birthday, we are sharing some of his scripts and sketches from the Art Linkletter Show. This was a weekly, half-hour show on the NBC network that featured candid camera-esque portions, presenting a situation to an unsuspecting person, as well as healthy dose of audience participation. Part of the show featured a panel of judges that would view a pre-filmed skit, in which the unsuspecting “victim” played a principal role. The scene would freeze at a crictical moment, in a midst of a decision making scene; panelists would predict how the “victim” behaved. If it was revealed that the panel’s decision was the same as the one that had actually occurred, the “victim” received less prize money; if the panel’s guess was wrong, the “victim” got a larger amount. Other features of the show included celebrity panelists, such as Carl Reiner and Jayne Meadows, a segment called “You Be the Judge” that presented live-acted scenes to the television audience (rather than the pre-filmed ones) for the audience to judge the outcome. We have excerpts of this segment for you to enjoy today. These come from the Hy Freedman papers, which are among the holdings at the American Heritage Center. 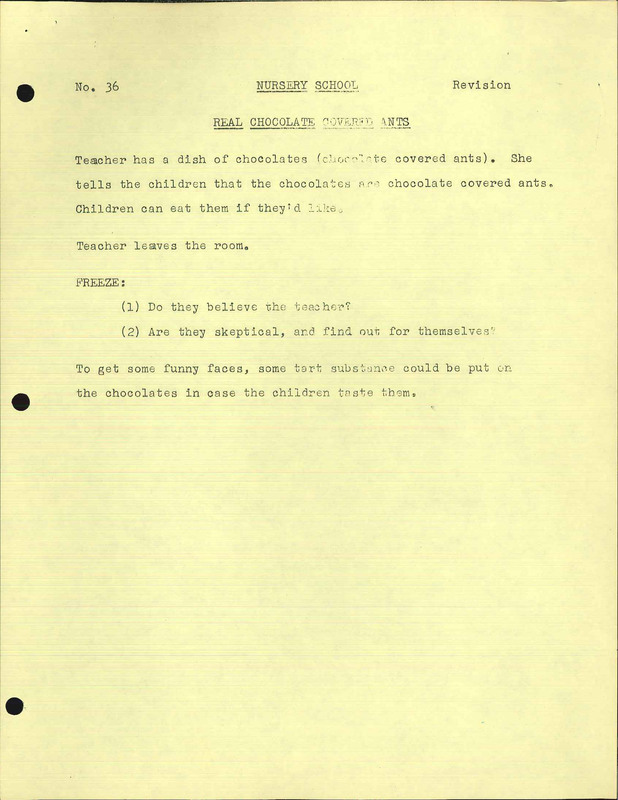 “Chocolate Covered Ants.” Hy Freedman papers, Box 2. American Heritage Center, University of Wyoming. 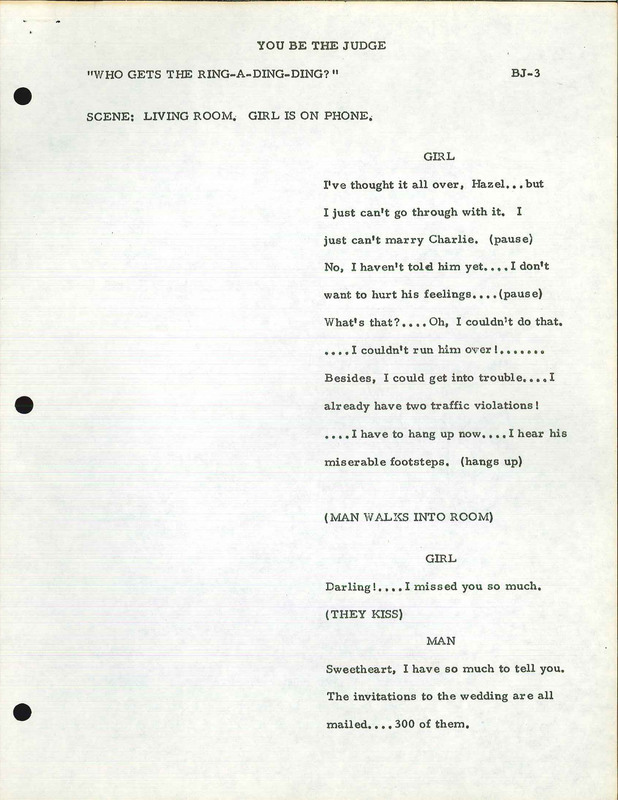 “Who Gets the Ring-a-Ding-Ding.” Hy Freedman papers, Box 2. American Heritage Center, University of Wyoming. 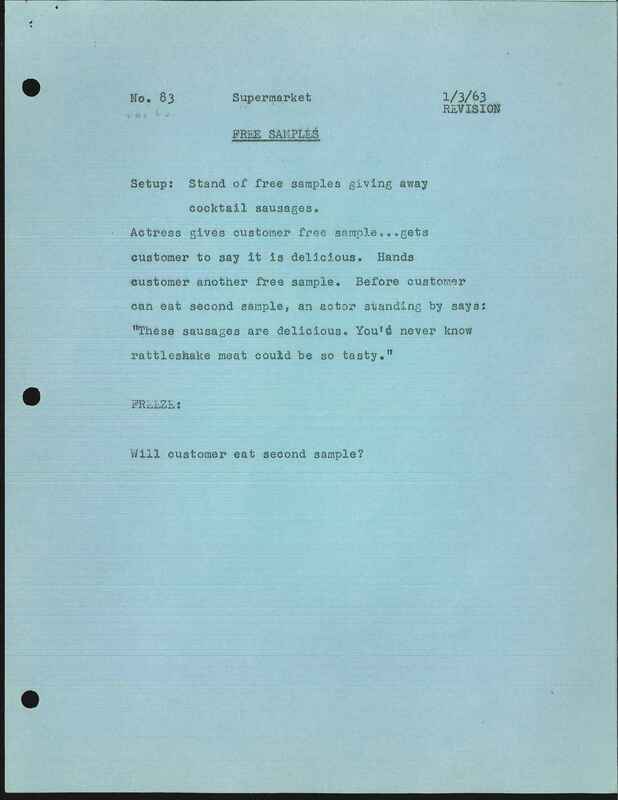 A lesson to us all–beware of free samples! Hy Freedman papers, Box 2. American Heritage Center, University of Wyoming. This entry was posted in popular culture, television history. Bookmark the permalink.